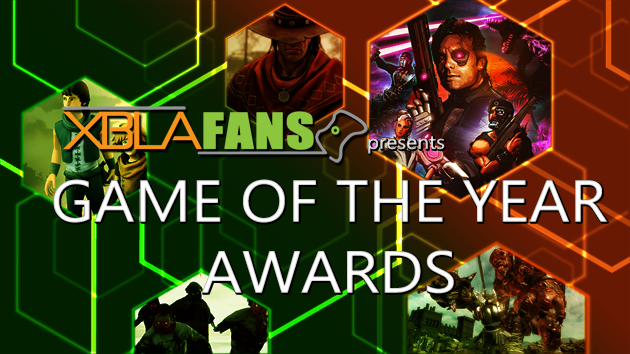 The year 2013 has come and gone, and you know what that means: XBLA Fans dropped the ball on getting our Game of the Year awards out during the same calendar year the games released. Apologies for our tardiness, but we’re here today to make it up to you with our awards for the very best XBLA games to release in 2013. After eight long and (mostly) wonderful years on the market, the Xbox 360 saw the beginning of its end in 2013 when its successor, the Xbox One, launched in November. 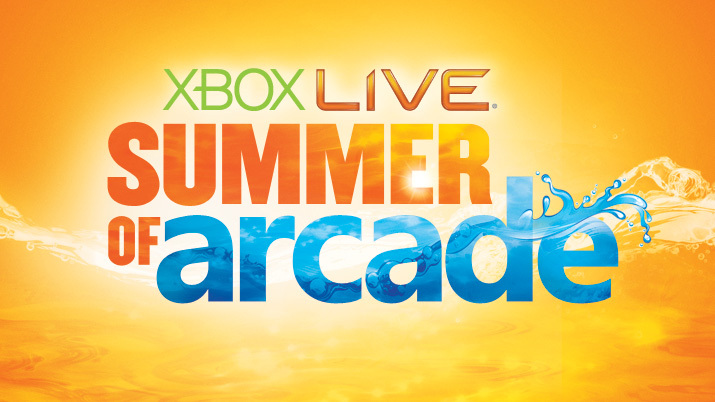 Of course, Microsoft’s last-gen console and Xbox Live Arcade platform weren’t about to go quietly into that good night. No, major releases continued throughout the year for Xbox 360 XBLA, and that trend looks to continue well into 2014 and possibly even beyond. That meant that picking out the best of the best XBLA games released last year was every bit as difficult for us as it’s been any other year. Games like Charlie Murder and Skulls of the Shogun were strong competitors that just missed landing on our list of 2013’s best. But enough about the games that didn’t make the cut. Let’s get down to what you came here for: the best XBLA games of 2013. Read on for XBLA Fans’ picks and let us know what your favorites were and which 2014 game you think will be worthy of being named Game of the Year at the end of next December. We’ve been talking all week about the turtles’ return to game form and the specifics of Red Fly Studio’s plan to unchain your inner turtle. Teenage Mutant Ninja Turtles: Out of the Shadows is trying to do a lot of interesting things. It’s attempting to merge the original spirit of the fiction with the appeal and accessibility of the new animated series. It’s injecting personality into the titular characters, not just in their dialogue, but their combat styles and mannerisms. It’s building a fighting scheme that’s trying to marry fast and fluid with balance and intuition and imbue elements of control and variety more closely at home in a fighting game than a brawler. It’s attempting to do all of this, but at the end of the day, it’s still a game – so let’s talk about gamification. If Out of the Shadows excels anywhere, it’s in going the extra mile to incorporate all those little pieces of Turtles fiction that really drives home the experience. 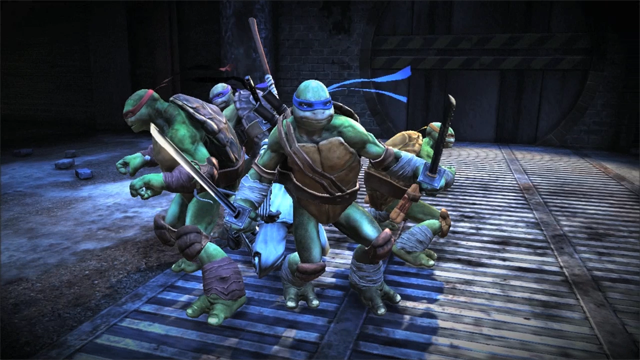 The game’s main menu structure, which could have been a series of colored rectangles: Campaign, Mission, Extras – has been smartly incorporated into the turtles’ interactive underground headquarters. You’ll roam the halls and visit the many facilities, each one with a unique purpose, as Frechette explains. 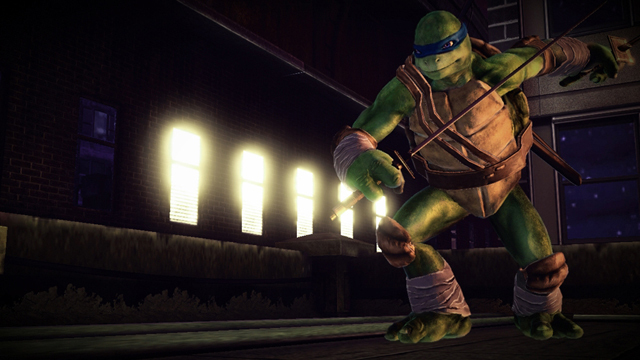 “I wanted to take the balance of Arkham Asylum, you know – when to attack, when to counter, that balance – and add in more of a fighting game element,” says Chris Frechette, Lead Designer of Red Fly Studio’s upcoming Teenage Mutant Ninja Turtles: Out of the Shadows. He wants to bring more control and variety to the scheme, as he says, “Recognizable combos and special attacks so you feel like, ‘I just did that,’ and it’s not just a random attack.” Frechette has been guiding us through his action brawler, intent on recreating the fast and fluid teamwork-centric combat that’s the cornerstone of Turtles fiction. When it comes to three-dimensional fighting schemes, it’s hard not to consider Arkham Asylum’s one of the greatest of the generation. It’s easy to pick up and play, empowering when employed against the mobs of thugs and street-trash that attack from all sides, and it’s extremely difficult – and rewarding – to master. But Frechette isn’t content to just repurpose what’s been done. As he walks us through what to expect when Out of the Shadows arrives, it’s clear he’s aiming for a whole new level of combat. In our last look at Teenage Mutant Ninja Turtles: Out of the Shadows we learned how Red Fly Studio plans to bring thirty years of TMNT fans together. That’s no simple task. The TMNT name has been scattered to the wind since shortly after its inception, divided among the many incarnations of the fiction, each with their own differences. There are fans of the comics, fans of the movies and fans of the many animated shows. There’s no right way to appreciate the Turtles, it would seem. 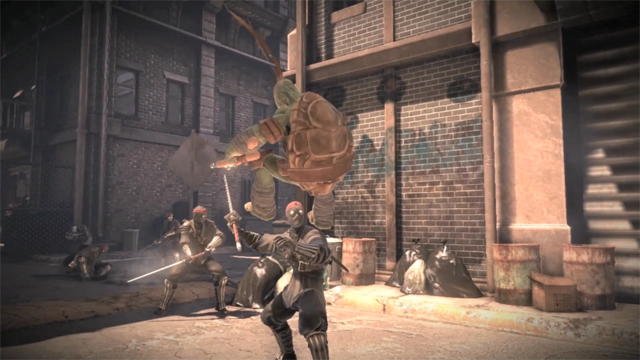 But as XBLAFans delved further into the game, guided by Lead Designer Chris Frechette and his passion for Out of the Shadows, we discovered the unifying appeal might be the differences in the turtles themselves. If there is one universal truth that pumps through the heart of every Turtles fan past, present or future, it would seem to be this: everyone’s got a favorite. The dynamic personalities of each turtle are anchor points to latch onto, letting you identify with a personality that mirrors your own. Individually they hold their own strengths and weaknesses, but together they rely on one another to form a fighting force. Whether you’re the intelligent one, the honorable one, the funny one or the tough one, you’re represented in the diversity of the heroes in a half-shell. It’s a powerful sentiment that Red Fly Studio aims to leverage in its forthcoming title. “One thing we wanted to do was not only have their personalities represented in their bodies and their facial animations, but blend that into combat in a way that hasn’t been done before,” Frechette says. 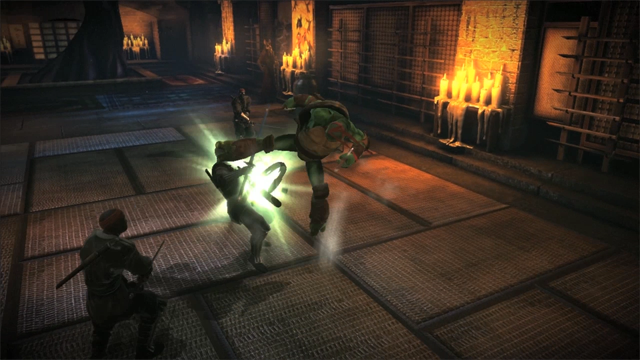 He’s loaded up the Shadowboxing mode in Out of the Shadows, where players will be able to get a feel for a turtle and his unique combat style. Unlike earlier games in the Turtles saga, Out of the Shadows will incorporate separate fighting disciplines for each turtle, bringing their personalities to life during combat, not just when they’re cracking wise and talking trash.